A stunning and relaxing oasis awaits you on the 9th floor of the hotel. As you lounge alongside the outdoor pool, unfold the fan-shaped menu and order your favorite cocktail or smoothie. The bar also has a wide selection of international wines and beers. Water flows through Thai culture. It nourishes rice in the fields, is joyously thrown during Songkran New Year celebrations, used in Buddhist blessing ceremonies, and offered as a welcome in homes. 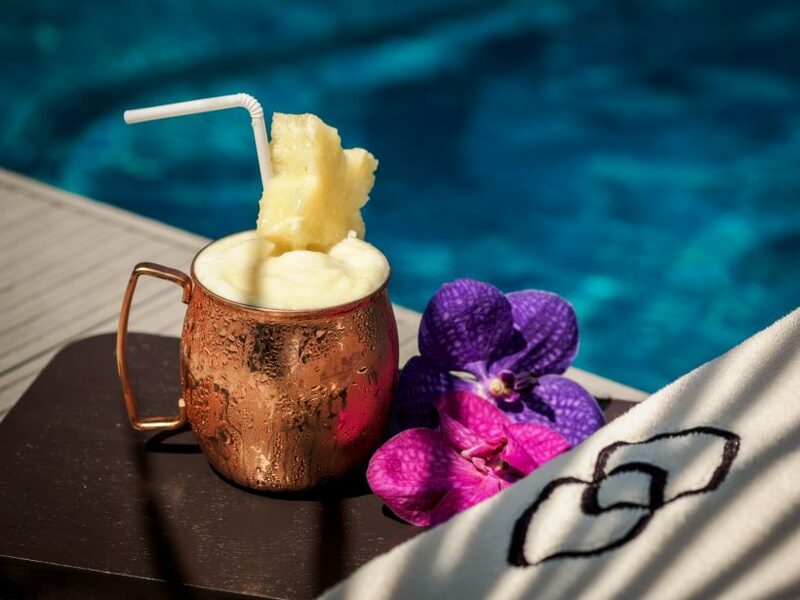 At Sofitel Bangkok Sukhumvit, we celebrate the abundance of life-giving water at Liquide. The beautiful oasis in the city is the perfect complement to Le SPA with L’Occitane and SoFit. The tranquil space features a 24-metre-long outdoor pool and Liquide Pool Bar. Here, you can find respite from the city, relax in sun loungers, enjoy a choice of mineral waters, a menu of light bites and Sofitel’s Delight menu selection for our health-conscious guests, or take a refreshing dip in the pool. Our poolside area is also the stage for glamorous events such as pool parties, weddings and fashion shows. Enjoy a meal or snack in this peaceful sanctuary. Our ambassadors bring dishes directly to your sun lounger, armchair or cabana.